As time passes, there are many toys we grow out of. But RC cars? Never. 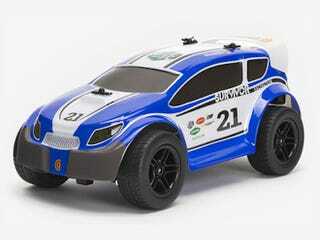 And just to tempt your inner nine-year-old even more, Griffin have made an RC rally car that's iOS controlled. For a little while, Gizmodo readers can get it for 60% off. Of course, the MOTO TC is nowhere near the first car that utilizes a touchscreen. But get a multiplayer race going, and it comes into its own. Managing your "damage" counter (the MOTO TC has sensors to detect impacts), and configuring your armor adds up to serious fun. Or as Giz put it, this is closest to real-world Mario Kart as you're going to get. Plus, Griffin have built the MOTO TC well, so it's not going to disintegrate after a bump like many kids' RC vehicles. Actually, now is a good time to grab one (or two, or three), as they have 60% off (now $39.99). Couple of things to note: the MOTO TC app is compatible with the iPhone 5 (all models), iPhone 4S, iPod touch 5th gen, iPad 3rd and 4th gen, and iPad Mini. This offer is only available in the Continental US, but shipping is free. To have a closer look at Griffin's latest plaything, check out the link below.